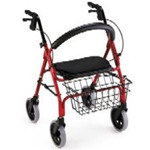 Value-Line Rollator. Ergonomic brakes. Adjustable handle height. Tote bag and basket with food tray standard. Locking hand brakes. Seat with built-in seat pad. Front wire basket. Removable back. Foldable.